Saint Austin's Pub: Libelle Fresco: Aesthetics and Function. Libelle Fresco: Aesthetics and Function. The more that I examine pens in person, the more I recognize the varying differences in build quality. The most important issue is how well the pen writes, but very close behind that is how the pen looks and feels. It is much the same with my dusty old Nissan Pathfinder - I always like, it but after I wash it it feels like it runs better. Our sensual impression of something really affects how we view the quality of the thing. Why do you suppose vintners invest so much into the artwork of their labels? They want to make a good impression because it predisposes us to expect the wine to taste good. Likewise, the more pleased I am with the appearance of a pen, the more I want to like the way it writes. Conversely, if I hate the way a pen looks or feels, I don't care how well it writes - I don't want to use it. I had that happen recently where I ordered a pen based on how it looked on the internet but disliked it so much in person that I did not care how well it wrote. 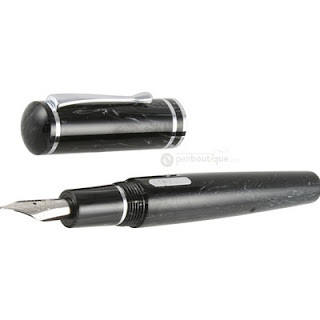 Off course the ideal is discovering a pen that looks great, writes well and is comfortable in your hand. One aspect of a pen's appearance that I really appreciate is resin quality - not just the color but also how the resin is mixed in order to achieve its particular design. Obviously some are easier than others, if commonality or rarity are indicators. For example the chipped varieties of resin apparently are easier than the swirl varieties because they seem to be more common. or, maybe the chipped resin is just more popular and so it is a question of supply to meet demand. Personally, I find the swirled resin to be a more interesting design, and it is much more difficult to find. My favorite is the Libelle Ivory Swirl that is no longer available - too bad. The Laban Mento Tiger Eye Swirl is also very nice. And, Laban's Celebration Oyster is fairly interesting. However, I observed that one of these pens had an interesting dot form in two spots on the pen and realized that there must be some form of imaging that goes into the production of the layering of the resins. Looking at the Laban website, you realize that they must sell more different models of pens than any other fine pen manufacturer. The Laban Mento alone has over two dozen resin options for that one model of pen! What other pen manufacturer does that? I recently received a black Libelle Fresco as a gift. The resin is not terribly interesting but the shape and wide diameter of the pen is unique. It is a very comfortable pen to hold. Unfortunately, the one I received had a bad nib, so I had to return it. Every other Libelle pen I've had wrote very nicely, so I expect that the replacement pen - once it comes in - will write just fine. I like the shape of the Fresco very much; I wish Libelle had offered it in a richer resin, like their earlier Ivory Swirl. UPDATE: The pen was sent back and the nib was adjusted but still not quite right. I wrote with it for a couple of weeks hoping that it would eventually break in, but finally gave up and returned it. Too bad. I really like the look and feel of the pen. But if it doesn't write well, no amount of good looks will make up for that. However, the pen that I exchanged it for was very nice. More on that to come . . .